Pentagon Pulls Blast Gauges Intended To Flag Battlefield Brain Injuries : Shots - Health News The military hoped the body-worn sensors would identify troops with brain injuries from a bomb blast. Instead, the sensors showed service members may be at risk from firing their own weapons. 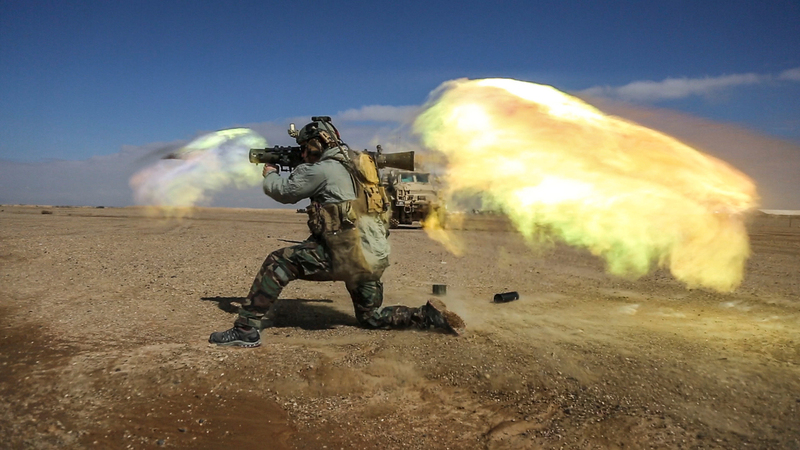 A soldier fires a Carl Gustav recoilless rifle system during weapons practice in Helmand province, Afghanistan. Heavy weapons like these generate a shock wave that may cause brain injuries. The Pentagon has quietly sidelined a program that placed blast gauges on thousands of combat troops in Afghanistan. NPR has learned the monitoring was discontinued because the gauges failed to reliably show whether service members had been close enough to an explosion to have sustained a concussion, or mild traumatic brain injury. But the small wearable devices did produce a trove of data on blast exposure that could eventually have helped researchers understand the links between bomb blasts, concussions and brain diseases. And they produced evidence that many service members are exposed to worrisome levels of blast pressure simply by being near a heavy weapon when it's fired. 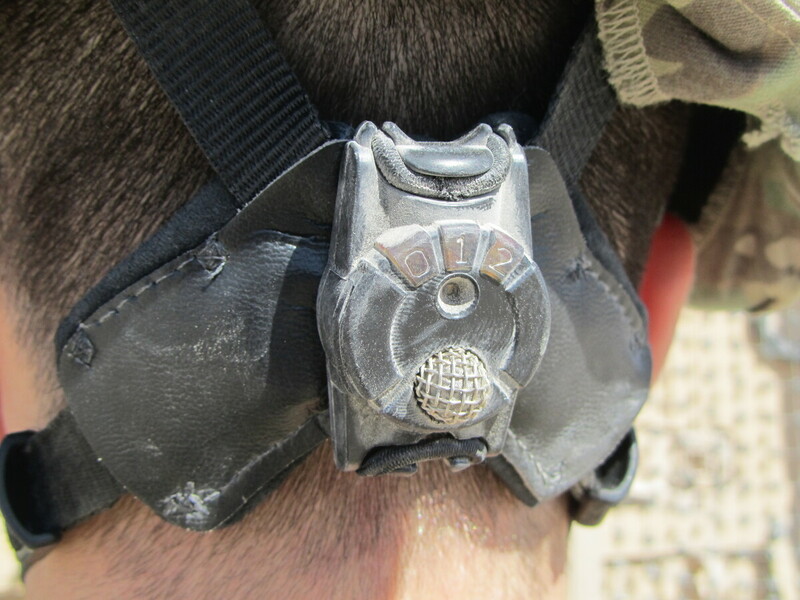 In 2011, the Army put blast sensors like this one on thousands of combat troops. The decision to warehouse the blast gauges is "a huge mistake," says retired Gen. Peter Chiarelli, who was the Army's vice chief of staff before retiring in 2012 and is now the chief executive officer of One Mind, a nonprofit focused on brain illness and injury. Mild TBI was the signature wound of the wars in Iraq and Afghanistan, affecting more than 200,000 troops. Having data from blast sensors could play "a very, very important role in helping us understand why an individual has negative effects from a concussion," Chiarelli says, "or why an individual develops one of the neurodegenerative diseases that seem connected with concussion, everything from ALS, to Parkinson's to dementia and even Alzheimer's." When NPR contacted the Army, a spokesman said it would be early 2017 before it could respond to an interview request. But Eric Fanning, secretary of the Army, did discuss the decision in a letter to Rep. Louise Slaughter, D-N.Y. One problem was that the gauges failed to show how much blast exposure is too much, Fanning wrote, adding that "The DoD's current inventory of blast gauges does not provide consistent and reliable data in the training or combat environment." The blast gauges are about the size of a quarter, and troops wear three of them on their helmets and upper bodies. The gauges contain sensors that measure overpressure, the sudden increase in air pressure caused by an explosion. An overpressure of just 5 pounds per square inch can burst an eardrum. One-hundred PSI can be fatal. And somewhere in between is probably where most concussions occur. The Army began outfitting thousands of combat troops with blast gauges in 2011. Kyle Sims was a Special Forces medic who helped deploy the gauges in Afghanistan. He remembers the first time he saw the gauges help a soldier. Oddly, the soldier hadn't been anywhere near a bomb blast. WATCH: Soldiers with the 1st Armored Division, 3rd Infantry Brigade, train in Afghanistan with the Carl Gustav recoilless rifle. It is the type of blast-intensive weapons system that can generate overpressure. "He was a soldier who fired a shoulder-fired rocket," Sims says. "And that shoulder-fired rocket actually gave him a pretty significant overpressure exposure just because he was firing it from a bit of a confined space." When the soldier returned from his mission, he said he had a headache, Sims says. "The medic checks his gauges, sees that he's got an exposure, takes him over to the hospital, gets a good neuro exam, [and] he gets diagnosed with a concussion." So this soldier's brain had taken a hit just from firing his own weapon. But the gauges had done their job. "And I thought that that was going to be the start of great things, you know, that we were really on the right path," says Sims, who began working with the company that makes the gauges this year, after leaving the service. As researchers began looking at the data from the gauges, it became clear the sort of exposure Sims had witnessed was pretty common. "The majority of exposures were not from improvised explosive devices, as you might expect," says David Borkholder, an engineering professor at the Rochester Institute of Technology and the founder of BlackBox Biometrics, which makes the blast gauges. Instead, the culprit was usually "blast-intensive weapons systems" like recoilless rifles, shoulder-fired rockets, artillery and mortars, he says. The reason is pretty simple. Firing something like a recoilless rifle generates a powerful pressure wave both in front of and behind the weapon. Those pressure waves are usually less intense than those from a bomb, Borkholder says. But exposures are far more common, and not limited to the battlefield. "A service member on the training range may experience 30 to 300 exposures per day multiple days per week," Borkholder says. That suggests many troops are routinely exposed to worrisome levels of overpressure as part of their job. And research in the past few years suggests that lots of small blows to the head can add up. "It's just like in the NFL," Sims says. "The more they look at it, the more they realize it's not the one time that the guy got knocked out on the field. It's the 200 times that he got hit hard enough to have an injury, but not symptomatic enough where he had to be removed from play." Despite what the blast gauge program turned up, the military considers it a disappointment. That's because the Department of Defense had a very specific goal: identifying troops with brain injuries caused by the blast wave from a bomb. And the military soon realized that an exposure high enough to cause a concussion in one person might have no effect on someone else, Borkholder says. "Their objective was to have this device basically predict if the person had a concussion, and it wasn't able to do that," he says. So a few months ago, the Army quietly warehoused the blast gauges. Chiarelli hopes the military will reconsider that decision and treat blast exposure like other potentially dangerous environmental factors, like radiation. "It's absolutely essential that we collect data in all instances where soldiers receive overpressure from whatever the blast is. If it's in training or combat or anything," Chiarelli says. That way, the military would know the total dose of overpressure each service member received during their time in service. And decades from now it might be possible to correlate that exposure to problems ranging from PTSD to Alzheimer's. A clear link between overpressure and brain diseases like Alzheimer's could prove costly to the military and veterans health systems. But Chiarelli doesn't believe that was a factor in the military's decision to stop using the blast gauges. "I'm not going to go that far," he says. "I would hope not." The Department of Defense says it's committed to determining the risks from overpressure exposure, both in combat and in training. It's also testing a new generation of blast gauges that are more sensitive and easier to maintain. But the military has made no commitment to deploying those gauges.